Diving the Cathedral is diving inside a huge cathedral like cave, next to a steep wall and on top of beautiful corals. At the Cathedral, Pescador Island, there is an unbelievable variety of corals, frog fish, schools of lion fish, barracudas, tuna and snappers, etc. There is a magnificent cave that has a heavenly view of the surface so it's easy to see why it's called the Cathedral. Occasionally you will meet sharks and at the north east side there is a plateau where you can find nudibranchs, shrimps and lots of other small marine life. 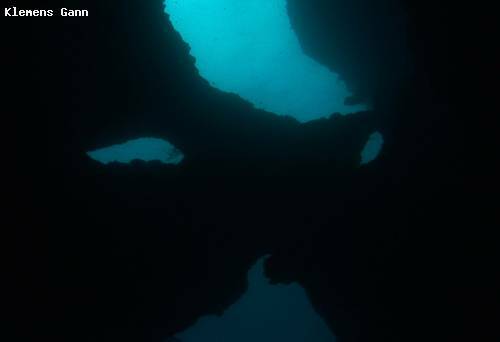 The wall is covered with soft coral which offers a home to octopus, moray eels, snake-eels, nudibranchs and many more. The Blue Abyss Dive Shop has been established in Moalboal since 1997 and is located right at the sea. We offer two boat dives and several House reef dives daily, in small, personal groups which will be accompanied by an experienced Divemaster /Instructor. We are familiar with the area for more than 10 years.